"Although women put all sorts of lotions, creams, conditioners, antiperspirants, and makeup on their faces and bodies daily, these products are not necessarily safe. The cosmetics industry remains one of the most unregulated in the US, with its products falling outside the jurisdiction of the FDA and the USDA. This means scare oversight, burdening the consumer with the job of evaluating the safety of each product purchased." Edward Bauman & Helayne Waldman (member, BC Study and Support), 2012. Contemplating Mary Washington’s breast cancer in the context of medical history revealed a much deeper and important question of causation. Cause is a question mostly survivors ask when diagnosed. And 240 years later, causes are still being discussed. If anyone looks up breast cancer on any major medical website, the only thing that is talked about is risk factors. Well, the only risk factor Mary had was older age at diagnosis. She had her children fairly young, breast fed all of them I would imagine, got plenty of exercise, sunshine, radiation machines did not exist and she was not involved with pesticides. So what caused her breast cancer? Well, I can only speculate on this and the only clues are environmental. In 18th century America it was not an easy life. All heating was done with burning and that left everyone breathing a lot of smoke. Now, Mary might have smoked herself since she grew tobacco. She also would be given calomel for ailments from doctors which is mercury (a heavy metal that is stored and damaging to the body) She would have been exposed to a lot of lead even in her china. They used pewter a lot–more heavy metal and also tin. If someone had cancer brewing certainly all that extra iron in the cooking pots did not help her either. 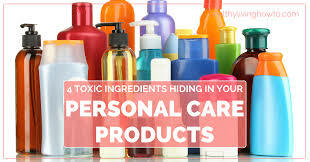 THINKING ABOUT PERSONAL CARE PRODUCTS? Characteristically, in an ink tattoo are toxic elements - such as nickel, chromium, manganese, and cobalt. In addition to commonly used carbon black, titanium dioxide (a white pigment) is often used to mix with other dyes to create different shades. Subsequent to a tattoo, the body seeks to rid these contaminants. One way is via the filtering lymph nodes. In the Schreiver I et al. 2017 study, in a study of four samples of lymph nodes, the researchers found that in two of the four samples of lymph nodes that the ink pigments and toxic elements were present both in the skin and in the lymph nodes. New Findings: The tattoo pigments and toxic elements were found to be in nanoparticle size in enlarged lymph nodes. What is the potential harm of having these toxic nanoparticles in our precious immune system - our lymph nodes? What if a breast cancer patient has a tattoo and is found to have enlarged lymph nodes on a scan? Will the doctors wrongly think that the patient has cancer that has spread to the lymph nodes? "FDA does not have the legal authority to approve cosmetics before they go on the market.." http://www.ewg.org/research/exposing-cosmetics-cover/myths-and-facts. ​ "I would say we've been surprised at the range of chemicals that have been found to cause mammary gland tumors in rodents; and how very common they are in our every day lives. And we have seen an increase in breast cancer incidence since the beginning of the chemical era, and perhaps we could roll some of the cancer back by reducing exposure." METABOLISM, LEADING TO THE INITIATION OF BREAST CANCER, OVARIAN CANCER, THYROID CANCER, AND PROSTATE CANCER? Silent Spring Institute's Rudel R et al. 2014 study cited below conducted seminal research on toxic chemicals that may increase the risk of breast cancer. Among the problematic chemicals is BENZENE. Benzene is found in such things as gasoline, vehicle exhaust, tobacco smoke, and solvents. We know that we should avoid benzene. But how does benzene harm us? Could estrogen be affected by an environmental toxin, such as benzene? The wonderful spouse researchers, Ercole Cavalieri, PHD and Eleanor Rogan, PHD, have long explored the effects of unbalanced estrogen metabolism. In their 2016 study, they stated, "Natural and synthetic estrogens contain a benzene ring. For compounds containing one or two benzene rings, there is a common mechanism of metabolic activation, which produces extremely weak ultimate carcinogens." .... More specifically, "There is a common mechanism of metabolic activation and reaction with DNA to form the N3Ade and N7Gua depurinating adducts for benzene." Can benzene unbalance - disrupt - estrogen metabolism? Estrogen metabolism - the breaking down of estrogen - is normally balanced by activating and protective enzymes. When estrogen is balanced, the "formation of the catechol estrogen quinones, the ultimate carcinogenic metabolites of estrogens, is minimized. These compounds are not available to react with DNA; therefore, cancer can not be initiated. When homeostasis is disrupted, however, excessive oxidation of catechol estrogens to quinones occurs. The quinones can react with DNA to form predominantly the depurinating adducts 4-OHE1-1N3Ade and 4-OHE1(E2)-1-N7Gua. The apurinic sites derived from the LOSS of these adducts from DNA lead to the mutations that can initiate cancer." Major metabolic pathway in cancer initiation by estrogens: "DNA with Apurinic ( loss of purine) Sites > Error-prone base excision repair > Mutations > Cancer. Are there high levels of depurinating estrogen-DNA adducts before breast cancer? In breast cancer? The levels of depurinating estrogen-DNA adducts are high in breast cancer patients, and in people at risk for getting breast cancer. Having these high levels of depurinating estrogen-DNA adducts before breast cancer "indicates that adduct formation is a critical factor in breast cancer initiation". Specifically, "In non-tumor breast tissue from women with breast carcinoma, the levels of 4-OHE1(E2) - which are estrogen-DNA adducts - were nearly four-times higher than the levels in breast tissue from women without breast cancer." Additional evidence of estrogen imbalance is found in "greater expressions of estrogen-protective enzymes" in women without breast cancer, and more "estrogen-activating enzymes" in the breast tissue of women with breast cancer. Not just breast cancer ..... Women with thyroid or ovarian cancer have high levels of estrogen-DNA adducts. Similarly, for men with prostate cancer or non-Hodgkin lymphoma. Can these high levels of estrogen-DNA adducts be blocked by taking supplements? The 2016 Cavalieri and Rogan study suggests using the supplements, N-actylcysteine (a component of glutathione), and resveratrol. (an antioxidant found in grapes, wine, peanuts, and other plants) to help maintain estrogen homeostasis. "These two supplements, N-acetylcysteine and resveratrol, inhibit formation of estrogen-DNA adducts in human breast cells and in women." "Ability of NAC (N-acetylcysteine), Res (resveratrol) or their combination to block formation of depurinating estrogen-DNA adducts in MCF-10F human breast epithelial cells treated with 4-OHE2. The numbers on bars are the percentage of the inhibition of the depurinating estrogen-DNA adducts compared to treatment with 4-OHE2 alone." Specifically, the two supplements were "additive in inhibiting formation of the depurinating estrogen-DNA adducts. N-acetylcysteine and resveratrol had similar inhibitor effects at low concentrations, but the effects of resveratrol were about 50% greater than those of N-acetylcysteine at high concentrations". HEALTHY BREAST PROTOCOL THAT INCLUDED N-ACETYLCYSTEINE AND RESVERATROL IN 21 HEALTHY WOMEN AGED 30-70. "Assessment of depurinating estrogen-DNA adduct ratios before women began treatment with the Healthy Breast Protocol and after having been on the treatment for 3 months. Green bars represent women whose adduct ratios decreased, blue bars represent women whose adduct ratios remained the same and the red bars represent a woman whose adduct ratio increased over the course of the study." "A Healthy Breast Protocol that included NAC and Res was administered to women. A group of 21 women (ages 30-70) who had never been diagnosed with cancer, participated. ... They followed the treatment daily for 3 months and provided a spot urine sample before starting the treatment and after the 3 month period. The urine samples were analyzed for catechol estrogen metabolites and conjugates, and depurinating estrogen-DNA adducts.... and the ratio of adducts to metabolites and conjugates was calculated..."
Results: "Of the 21 women participants, 16 experienced a decrease (green bars) in the ratio of adducts to metabolites and conjugates, four remained the same (blue bars), and one had an increase (red bars). The decrease in the ratio after treatment was statistically significant. These results indicate that a treatment including NAC and Res can reduce depurinating estrogen-DNA adduct levels in people." Conclusion: "Thus, NAC and Res, by inhibiting formation of depurinating estrogen-DNA adducts, maintain homeostasis in the metabolism of estrogens." The EDITORS wish to thank Dr. Ercole Cavalieri for his kind communication many years ago, in which he expressed his wish as a researcher to help breast cancer patients! WHICH CHEMICALS INCREASE BREAST CANCER RISK? Researcher Julia Brody, PHD, commented, "We're talking about chemicals that are in air pollution, diesel exhaust, gasoline, perfluorinated compounds - those are in non-stick and stain resistant surfaces - some flame retardants and a variety of chemicals that are in consumer products and workplaces." In a 2014 interview with Steve Curwood, Julia Brody, PHD, the Director of the Silent Spring Institute, stated, "One of the most important areas we found was the number of breast carcinogens in gasoline and in auto exhaust and diesel exhaust. We can each reduce our exposure to them by reducing use of gasoline, for example, by getting an electric lawn mower or high-efficient vehicle. And we can also take action at the community level. For example, you often see buses or cars idling in front of a school, and if those engines are turned off, then the kids and the parents who are picking them up are not exposed so much to these breast carcinogens. These chemicals in gasoline and vehicle exhaust include benzene and polycyclic aromatic hydrocarbons (PAHs). These are priorities on our list of breast carcinogens." "PRIORITIES" ON CHEMICALS INCREASING BREAST CANCER ARE BENZENE AND PAHS. - WHAT IS BENZENE IN? HOW ABOUT PAHS? Avoiding, or at least minimizing, the risk of exposure to benzene and PAHs may not be easy, as these are pervasive chemicals. PAHs: Benzo[a]pyrene is a polycyclic aromatic hydrocarbon found in coal tar.... "The main source of atmospheric benzo[a]pyrene is residential wood burning. It is also found (in addition to coal tar), in automobile exhaust fumes (especially from diesel engines), in all smoke (resulting from the combustion of organic material (including cigarette smoke), and in charbroiled food. Cooked meat products, regular consumption of which has been epidemiologically associated with increased levels of colon cancer (although this in itself does not prove carcinogenicity), have been shown to contain up to 4ng/g of benzo[a]pyrene, and up to 5.5 ng/g in fried chicken, and 62.6 ng/g in overcooked charcoal barbecued beef." In the Severson PL et al. 2014 study, the researchers stated that, "Genetic mutations are known to drive cancer progression, and certain tumors have mutation signatures that reflect exposures to environmental carcinogens." In fact, "Benzo[a]pyrene has a known mutation signature.." Benzo[a]pyrene can induce changes in the DNA sequence that can drive healthy mammary epithelial cells past tumor suppressor status towards immortality. Conclusion: " .... Acute exposures of human mammary epithelial cells to high dose benzo[a]pyrene recapitulate mutation patterns of human tumors and can induce mutations in a number of cancer driver genes." Thus, it is not just speculation that some toxins, such as benzo[a]pyrene, which is found in such things as wood burning, automobile exhaust, cigarette smoke, and charbroiled food, can cause mutations and increase the risk of cancer. Amazingly, the researchers can actually look for that mutation signature - a rather toxi signature - when conducting their studies. And, in the case of benzo[a]pyrene, finding its toxic signature is critical, since the toxin can induce changes in the DNA sequence that can drive healthy mammary epithelial cells past their tumor suppressor status towards immortality. Severson PL et al., 2014, cited just above. In the Guo J et al. 2015 study, the researchers found that benzo[a]pyrene "increased the migration of breast cancer cells both in vitro and in vivo." How does the toxin, benzo[a]pyrene, increase the migration of breast cancer cells? There is an "up-regulation of ROS-induced ERK signaling, which leads to the activation of matrix metalloproteinases 9". More specifically, ERK helps communicate a signal from the receptor on the surface of the cell to the DNA to activate metalloproteinase 9 that degrades the extra cellular matrix and promotes tumor progression. When asked about cooking on the stove, Julia Brody, PHD, stated, "There are two things you can do. One is to turn on the ventilation fan so you're exhausting the PAHs and the smoke out of your house. The other thing is to cook at a lower temperature, so you're not creating char on your food. Delicious as it may be, it does contain breast carcinogens, and if you just cook at a lower temperature, or marinate before you cook, that will reduce your exposure." "- Limit exposure to exhaust from vehicles or generators, don't idle your car, and use electric lawn mowers, leaf blowers and weed whackers instead of gas-powered ones. - Use a ventilation fan while cooking and limit how much burned or charred food you eat. - Do not buy furniture with polyurethane foam, or ask for furniture that has not been treated with flame retardants. - Avoid stain-resistant rugs, furniture and fabrics. - Use a solid carbon block drinking water filter. 1. " BHA and BHT - Suspected endocrine disrupters in moisturizers and makeup. 3. DEA-related ingredients - Used in creamy and foamy products, such as moisturizers and shampoos. Can react to form nitrosamines, which may cause cancer. endocrine disrupter and reproductive toxicant. marketed as being unscented - can trigger allergies, asthma. Some linked to cancer, neurotoxicity. 8. PEG compounds - In many cosmetic cream bases. Can be contaminated with cancer- causing 1,4 dioxane. Also for related chemical propylene glycol and other ingredients with the letters "eth" (e.g., polyethylene glycol). 9. Petrolatum - Used in some hair products for shine, as a moisture barrier in some lip balms, lip sticks, and moisturizers. May contain cancer-causing PAHs. 10.Siloxanes - Ingredients ending in "-siloxane" or "-methicone." Used to soften, smoothand moisten in some cosmetics. Suspected endocrine disrupter, reproductive toxicant (cyclotetrasiloxane). the letters "eth" (e.g., sodium laureth sulfate). anti-perspirants. Suspected endocrine disruptor and may contribute to antibiotic resistance in bacteria. Harmful to fish and other wildlife." From the Environmental Working Group: "There is no end to the tricks that endocrine disrupters can play on our bodies: increasing production of certain hormones; decreasing production of others; imitating hormones; turning one hormone into another; interfering with hormone signaling; telling cells to die prematurely; competing with essential nutrients; binding to essential hormones; accumulating in organs that produce hormones." The dirty dozen include BPA (see below), dioxin, atrazine, phthalates, perchlorate, fire retardants, lead, arsenic, mercury, perfluorianted chemicals, organophophate pesticides, and glycol ethers. 1. BPA-FREE PRODUCTS? MAYBE MORE ESTROGENIC THAN BPA? 2. BPA CAN "BYPASS" BODY'S BARRIERS AND "BURROW DEEP IN "CELLS". YIKES! BPA IS IN HARD PLASTICS, LININGS OF TIN CANS, DENTAL SEALANTS, BLOOD BAGS, CASH REGISTER RECEIPTS. In Mariah Blake's wonderful 2014 article in Mother Jones, The Scary New Evidence on BPA-Free Plastics, she related how 18 BPA-free plastic cups were tested for estrogenic activity. It turns out that, "More than a quarter ... came back positive for estrogenic activity." This finding comported with a recent study that reported that, " .... 'Almost all' commercially available plastic that were tested leached synthetic estrogens - even when they weren't exposed to conditions known to unlock potentially harmful chemicals, such as the heat of a microwave, the stem of a dishwasher, or the sun's ultraviolet rays. ... Some BPA-free products actually released synthetic estrogens that were more potent than BPA." BPA's harm is commensurate with its pervasive nature in our society. " ... BPA, is a chemical used in clear, hard plastic, particularly the variety known as polycarbonate, to make them more flexible and durable. (It's also found in every day items, from dental sealants and hospital blood bags to cash register receipts, and the lining of tin cans.) Naturally occurring estrogens bind with proteins in the blood, limiting the amount that reaches estrogen receptors. But Frederick Vom Saal (a Professor at the University of Missouri) found this wasn't true of BPA, which bypassed the body's natural barrier system and burrowed deep into the cells of laboratory mice." And there was disturbing research about BPA. " ... A new body of research was finding that BPA altered animals' genes in ways that caused disease. For instance, it could switch off a gene that suppresses tumor growth, allowing cancer to spread. These genetic changes were passed down across generations. 'A poison that kill you,' vom Saal explains. 'A chemical like BPA reprograms your cells and ends up causing a disease in your grandchild that kills him.". A study co-authored by researchers at Duke University and the Environmental Working Group has detected evidence of a common nail polish chemical called triphenyl phosphate, or TPHP, in the bodies of every women who volunteered to paint her nails for the study. The results represent compelling evidence that TPHP, a suspected endocrine-disrupting chemical also used in plastic manufacturing and as a fire retardant in foam furniture, enters the human body via nail polish. These results are troubling and as a fire retardant in foam furniture, enters the human body via nail polish. These results are troubling because a growing body of scientific data from other studies indicates that TPHP causes endocrine disruption, meaning that it interferes with normal hormone functioning." Of over 3000 nail polishes in the EWG's database, 49% have TPHP. But just how can nail polish enter the body? "The researchers theorized that other polish ingredients such as solvents rendered nails more absorbent. They also suspected that the network of capillaries in the cuticle that surround the nail might play a role in carrying the chemical into the body." WITH OTHER SIGNALING PATHWAYS (HER2 LIGANDS)? Yes! ...... According to the Pan S et al. 2015 Silent Spring Institute study. 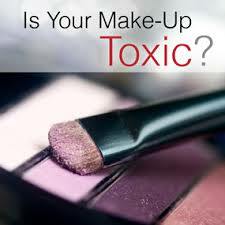 Some of the toxic chemicals cited above in the list of dirty dozen cosmetics are known as "endocrine disrupters". These are xenoestrogens which can bind to estrogen receptors and mimic estrogen (estradiol). How about parabens? After all, parabens are listed as "endocrine disrupters". Defining parabens: "Parabens are common ingredients in cosmetics, shampoos, body lotions and sunscreens, where they are used to prevent microbial growth and prolong shelf life." Parabens actually aren't known to be very estrogenic. "The most estrogenic paraben, butyparaben, was found to be 10,000-fold less potent than E2 (estradiol)." But the Silent Spring Institute researchers pondered: What about studying parabens along with other signaling pathways that cause proliferation? Couldn't another signaling pathway potentiate the parabens' effects in sensitizing the estrogen receptor (ERa) to low dose parabens? So, the researchers chose to study HER ligands. Growth factors, such as heregulin (produced by breast cells) and epidermal growth factor, activate downstream signaling pathways that result in a phosphorylation of ERa, and a consequential enhanced ligand binding to the estrogen receptor. From the Press Release: "The researchers activated the HER2 receptors in breast cancer cells with a growth factor called heregulin that is naturally made in breast cells, while exposing the cells to parabens. Not only did the parabens trigger the estrogen receptors by turning on genes that caused the cells to proliferate, the effect was significant: The parabens in the HER2-activated cells were able to stimulate breast cancer cell growth at concentrations 100 times lower than in cells that were deprived of heregulin." Conclusion: "The study demonstrates that parabens may be more potent at lower doses than previous studies have suggested, which may spur scientists and regulators to rethink the potential impacts of parabens on the development of breast cancer, particularly on HER2 and estrogen receptor positive breast cells." And,note, from the study, that while HER2 breast cancer accounts for some 25% of breast cancer, "In a study of 363 breast tumors, it was found that 80%-96% of the tumors expressed at least one of ten tested HER ligands. Similarly, another study found that 48% of breast tumors express heregulin. Breast tumors may therefore potentiate their own response to estrogenic compounds by producing HER-ligands." WOW! Import: "We suggest that reevaluation of the potency of other xenoestrogens in the presence of HER ligands is warranted in the light of our findings." Thus, "While this study focused on parabens, it’s also possible that the potency of other estrogen mimics have been underestimated by current testing approaches,” says co-author Chris Vulpe, a toxicologist who is now at the Center for Environmental and Human Toxicology at the University of Florida College of Veterinary Medicine." EDITORS' NOTE: And even low dose "endocrine disrupters" may possibly promote breast cancer. How? Endocrine disrupters can bind to the estrogen receptor and mimic estrogen and promote breast cancer. Take the case of parabens. Parabens are found in cosmetics, shampoos, body lotions, and sunscreens as preservatives. But parabens are weak xenoestrogens. However, when parabens were tested in the Pan S et al. 2015 study discussed above along with the growth factor, heregulin - that is made in breast cells - that acts upon HER breast cancer cells, there is cross talk with estrogen receptors, making even low dose parabens more powerfully able to stimulate breast cancer. Drawing upon other research finding that 80%-96% of all tumors express at least one of ten tested HER ligands, and another study finding that 48% of breast tumors express heregulin, Pan S et al. hypothesize that, "Breast tumors may therefore potentiate their own response to estrogenic compounds by producing HER ligands." Incredible! 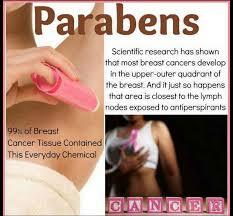 The breast cancer cells are responding to the endocrine disrupters, parabens, etc. by making HER ligands that can help make them proliferate even more!! USE LIPSTICK? LEAD AND MORE! There is lead in lipstick. "Why is there still lead in lipstick? Easy. It makes lipstick stay on your lips longer." One of the Editors evokes chuckles when she tells people that she uses beets for makeup! Beets can be used as blush-on and on the lips. In the 2005 Darbre PD et al. study, the researchers studied the effects of aluminum, antiperspirants, and breast cancer. Particularly intriguing is that, "Clinical studies showing a disproportionately high incidence of breast cancer in the upper outer quadrant of the breast together with reports of genomic instability in outer quadrants of the breast provide supporting evidence for a role for locally applied cosmetic chemicals in the development of breast cancer.". The researchers found that aluminum is another metal that has an influence on estrogen. "Estrogen is a well established influence in breast cancer and its action, dependent on intracellular receptors which function as ligand-activated zinc finger transcription factors, suggests one possible point of interference from aluminium. Results reported here demonstrate that aluminium in the form of aluminium chloride or aluminium chlorhydrate can interfere with the function of oestrogen receptors of MCF7 human breast cancer cells both in terms of ligand binding and in terms of estrogen-regulated reporter gene expression." And, further, the researchers commented, "Given the wide exposure of the human population to antiperspirants, it will be important to establish dermal absorption in the local area of the breast and whether long term low level absorption could play a role in the increasing incidence of breast cancer." EDITORS' NOTE: In addition to aluminum's possible influence on estrogen, aluminium has been proposed to be a "water stressor". As a water stressor, aluminum disrupts the aqueous environment of the cell (dehydrates the collagen in the extra cellular matrix), rendering the cell more cancer-like. For the Davidson R et al. 2013 study, go to SELF-HELP's WATER section!